The typical tales that are told." Is more than you get from an ingot." One of the unquestioned beliefs in the investment world is that of gold as a hedge against inflation. This is usually presented as what social scientists would call a "stylized fact" - such a commonly accepted truth that one needn't bother proving it. Only... if you did try to prove it, what would you find? According to Barron's Mark Hulbert, you would find "One of the 5 Reasons Not To Buy Gold." "Over any of the time periods assumed by investors — from the short term to as long as 20 years — gold's real price has fluctuated wildly," writes Mr. Hulbert. This is actually one of the conclusions of a new study from the National Bureau of Economic Research, written by Claude Erb of Trust Co. of the West and Campbell Harvey of Duke University. Erb and Harvey demonstrate that, while gold may hedge inflation over the centuries, in the time periods of greater interest to investors it has been a poor inflation hedge. 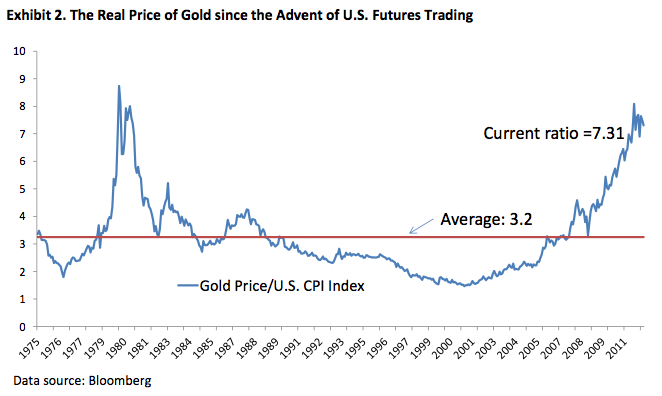 The table above, showing the price of gold as a multiple of US CPI, illustrates the wide gaps that occur between gold and inflation. Moreover, in observing a series of 10-year time horizons from 1985 to 2012, the authors find that, while the 10-year annualized inflation rate varied from about 2% to 7%, the 10-year annualized return on gold was as low as -6% and as high as 20%. The fact that the last several years' return on gold has been so high is likely both a cause and effect of investors' willingness to ascribe special powers to the glittery metal.